Technozym® ADAMTS-13 Activity is a chromogenic ELISA kit for the determination of ADAMTS-13 activity in human plasma. ADAMTS-13 is an enzyme that specifically cleaves unusually large von Willebrand Factor multimers, which induce platelet thrombus formation under high shear stress. If the activity of ADAMTS-13 is lowered for some reason, unusually large vWF multimers may accumulate. 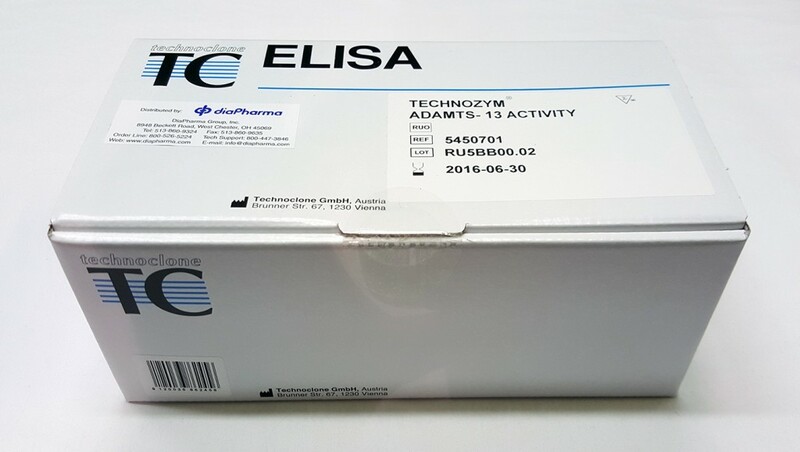 ELISA test strips (12), with 8 wells each, coated with a monoclonal anti GST- Antibody. The drying agent is supplied in an aluminium bag. Stability after reconstitution: expiry date. GST-vWF73 Substrate; 2 vials; lyophilized; 6 mL. Stability after reconstitution: 6 weeks. Calibrators (standards) numbered from 1 to 6; lyophilized; 1 vial each; 0.5mL. Stability after reconstitution: 6 months. Concentrations are lot-specific; consult the label on the vial. High and low control plasma, lyophilized, 1 vial each, 0.5 mL. Stability after reconstitution: 6 months. Concentrations are lot-specific; consult the label on the vial. Reaction buffer; 1 vial; 30 mL; ready to use. Stability after reconstitution: 6 months. Conjugate: HRP conjugated monoclonal anti-N10 Antibody: 1 vial; 12mL; ready to use. Stability after reconstitution: 1 month. Color reagent TMB (Tetramethylbenzidine); 1 vial; 12mL; ready to use. Stability after reconstitution: expiry date. Wash Buffer concentrate, 10-fold concentrated, 1 vial, 32mL. Stability after reconstitution: 6 months. Stop solution; sulphuric acid 0.5mol/L, 1 vial, 12 mL; ready to use. Stability after reconstitution: expiry date. Sample dilution Microplate, 1 plate (ONLY for sample dilution!). The expiry date printed on the labels applies to storage of the unopened vial at 2-8 °C. ADAMTS-13 (a disintegrin-like and metalloproteinase with thrombospondin type 1 motif 13) is an enzyme (vWF-cleaving protease or vWF-CP) that specifically cleaves von Willebrand Factor (vWF) multimers. Many of the original assays for measuring ADAMTS-13 activity involved using a multimeric vWF substrate that was either plasma-derived or recombinant. These assays are time consuming (from 2 to 4 days) and difficult to reproduce between testing centers. Many of the issues were circumvented by the development vWF peptide substrates, leading to a turn-around time from 1 to 4 hours. ADAMTS-13 substrates (ie, FRET substrates) were eventually developed into commercial kits. However, differences in the technology used for measuring ADAMTS-13 activity in the kits may result in limitations in various products giving discrepant results. Some limitations in any method for measuring ADAMTS-13 activity may be unavoidable; however, lack of interferences and accurate measurement at very low ADAMTS-13 activity are critical in laboratory assays. Fluorescent assays also have numerous limitations, such as interferences from plasma proteins such as hemoglobin and bilirubin. For example, bilirubin absorbs light at the same wavelengths as the chromophores in FRETS-vWF73, and hemoglobin absorbs at 550 nm and also directly inhibits ADAMTS-13 regardless of the assay method. There is some recent evidence that unconjugated bilirubin can directly inhibit ADAMTS-13 as well. It’s possible to lessen these issues by dilution, but this may result in limiting assay sensitivity, which is critical for ADAMTS-13 assays. 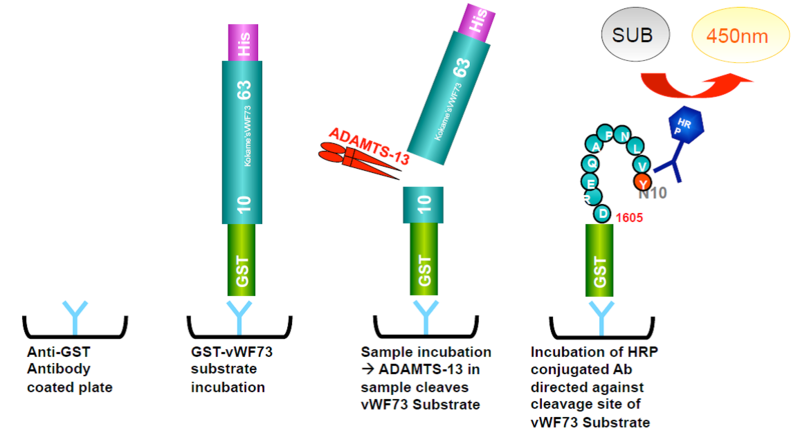 Liquid phase FRET assays are also subject to discrepancies because of cleavage of the ADAMTS-13 substrate (ie, vWF73) by other proteases. For example, the presence of elastase in a sample mixed with the substrate will result in cleavage leading to a measured fluorescent signal, when any peptidyl bond between the 2 fluorescent dyes is cleaved. While levels of ADAMTS-13 in the plasma sample will always vary depending on the disease condition (which may result in abnormal levels of many different proteases and other proteins), protease interference can be reduced during the actual assay if the ADAMTS-13 is first captured on a plate followed by washing before adding the FRET substrate. ELISA plate-based methods can reduce or eliminate these interferences, as the sample is washed away. An additional alternative is to avoid fluorescent assays using a standard chromogenic ELISA method (HRP/TMB reagents) that requires standard ELISA equipment rather than a fluorescent reader. Peptide vWF substrates are still used but a unique method that captures the substrate on the plate and, with ADAMTS-13 from the sample, cleaves the peptide to expose a neo-epitope. This new epitope can be recognized by a specific antibody allowing ADAMTS-13 activity to be determined by ELISA. A high sample dilution can avoid bilirubin and hemoglobin interference. In addition, protease interference is minimized using an antibody very specific to the ADAMTS-13 cleavage site (Tyr1605-Met1606), and most proteases (ie, elastase) cleave a different site (ie, M1606-V1607 or V1607-T1608). Only cathepsin G may have the same cleavage site. Using this type of assay, sensitivity down to 0.5% ADAMTS-13 activity can be reached.